In 1990, when I lived in Virginia and was still writing Midnight Harvest The Lady From Heaven, I took the kids to the National Zoo in Washington. It was a drizzly Wednesday, and the place was almost deserted, with far more animals present than humans. The primate house has a great area in the middle surrounded by the glass-walled cages. The only visitor other than us, was a woman sitting on a bench, making odd motions with her arms. The orangutan on the other side of the glass watched her intently, then made gestures of his own. I had seen enough deaf people in Georgetown (Gallaudet University is there) to know I was watching two beings communicate in ASL (American Sign Language). I knew about the experiments with Washoe the chimp and Koko the gorilla, but this orang seemed to be an ordinary primate in an ordinary zoo. I asked the woman what was going on. 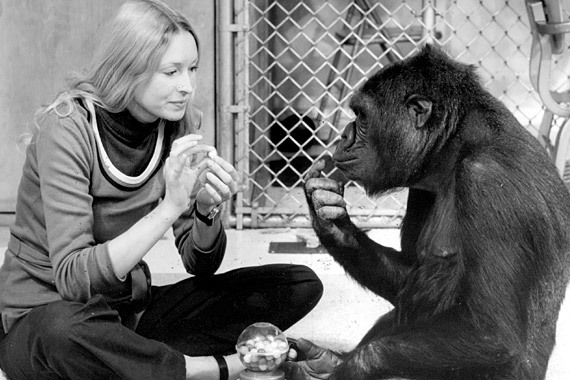 It seems she was a teacher at Gallaudet who had no classes Wednesdays, so she spent those days at the zoo. She said the zookeepers, who had also read about Washoe and Koko, had taken it on themselves to learn a few Signs and then to try and pass them on to the other primates. The original experiments were based on the assumption that other primates have no language of their own, and therefore must be taught from infancy if the experiment is to be a success. If this premise were correct, the zookeepers should have been unsuccessful—but they weren't. It's important to appreciate the magnitude of this discovery. Rarely, a feral human is found who has never been exposed to language; and it is almost impossible to teach them language after they are found—they may learn a few words, or even use a phrase or two; but apparently language must be introduced at an early age or the wiring in the brain necessary for encoding and decoding it never develops. Therefore, if primates had no language at all, human or otherwise, for them to learn to communicate fluently in ASL would mean they are mind-bogglingly smarter than humans. Alternatively, that they can learn ASL suggests that they do have language—albeit non-human—before the zookeepers get to them. As I heard her story, I was at once excited and horrified. In a totally casual and unexpected manner, I had come face to face with proof that my species is not the only intelligent one native to Earth. On the other hand, that meant that several thousand innocent and intelligent beings are imprisoned with no hope of parole and no understanding of why they are so incarcerated. I suppose if I were a political activist I'd have staged a demonstration. But as a writer, I felt the best way to bring this to the attention of the general public is to write a story so compelling that everyone would want to read it. This is a project I've had to back-burner for too long, but which still interests me. In any case, some months later I visited a home for retired primates near Tampa, Florida, where I saw many Signing chimpanzees and one Signing gorilla. Conditions were terrible. The cages were small, with no TV or toys. Almost all the animals there had been household pets whose owners had died. Most of the apes had succumbed to apathy or worse. By then I had learned a few Signs, though, and was able to greet two of the chimps and receive a return greeting. Most of our facial expressions are similar; I wish you could have seen their gratitude at being acknowledged by someone, even for a few moments. It literally made me cry. Then I took a course in ASL. It is a fascinating language, quite unlike English in many ways. When you read in a report that Koko the gorilla Signed, "Me want cat. Cat ball cat," you are reading a word-for-word translation of the Signs she used. This is like translating, "Mi muchacha bonita es simpatica" as "My girl pretty is nice." In both Spanish and ASL, words are not ordered the same as in English, making a word-for-word translation extremely misleading. Koko Signs with grace and wit, and a true (as opposed to accurate) translation of her Signs would be more like, "I want my cat; she is just a fluffy ball." In the years since, Koko has been taught to read; she also understands spoken English, although she lacks the vocal configuration to produce it. The primitive "translations" one reads about are forced by the Christian fundamentalists, who refuse to believe that we humans are not the only people on the planet. When the apes sound too smart, the fundamentalists cut their funding off. Why haven't you heard of this before? Once again, due to a result of the de facto conspiracy between the religious fundamentalists, the politicians they own, and the mass media that parrots their official positions. You, personally, can visit your local zoo and learn for yourself that the primates there know Sign Language. But even if you do, you are likely to come to the conclusion that what you have experienced is a just a fluke, and not yet another example of the powers-that-be abusing yet another species.